1. When is Springfest held? Join us for great food, fun for children and adults, vendors, plant sale and the auction beginning at 11:00 on Sunday! 2. Where is Springfest held? Springfest is held on the grounds of St. Patrick Catholic Church located at 301 Shamrock Trail, Adamsville (next door to Minor High School on Minor Parkway). 3. How much does it cost to attend Springfest? Come and join us for free! 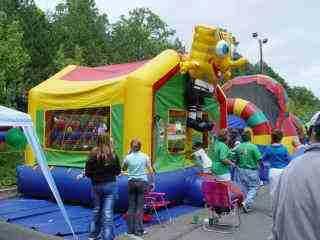 Children's games and inflatables bear various costs. 4. Is parking a problem at Springfest? Parking is never a problem at Springfest. All Springfest attendees park on the grounds of the church. 5. May I get my food to go? Take outs are available in the dining room. You may purchase any food on the menu in a to-go container. 6. How can I apply get a vendor table? Contact our chairperson, Pam Palmer, via private message on Facebook to get more information about our vendor spots.